Personas are marketing code for “knowing your audience.” When you truly know your audience, you produce personalized content that delivers positive results. Marketers who use buyer personas and map content to the buyer’s journey enjoy 73% higher conversions compared to companies not pursuing this approach. Let’s take the mystery out of “knowing your audience.” You’ll walk away with the tools to develop great B2B buyer personas and purposeful content. Feel free to use our buyer personas template down below to jumpstart your messaging strategy. Build buyer personas with collective knowledge. When you’re building buyer personas, this is not introvert time. Quite the opposite, it’s collaboration time. The best buyer personas are built by the collective knowledge of your team. Otherwise, you risk creating buyer personas with a tunnel-visioned approach versus a 360-degree customer view. This misstep can wreak havoc because there will be a major disconnect in the foundational language you use to speak to clients. Inevitably, siloed persona development will impact the performance of your content marketing efforts. The smartest marketers know when it’s time to get out of their own heads. Before you start thinking up clever names or digging into aspirations and obstacles, lay out the buyer persona strategy in a brainstorming session with your team. Decide who will be involved. And, be prepared to explain the value of buyer persona research so team members know why they should give up other priorities to collaborate on a content strategy. Look far beyond the marketing department to the team members who work on the organizational frontlines every day. If possible, aim to have someone representing each key area of your organization to help you rough out several buyer personas. Customer success and sales teams are especially valuable during a buyer persona exercise. Think of each buyer persona as a key character in your marketing story and uncover their driving force. This is where data comes in. Construct solid buyer personas with data. As B2B content marketers, there are times when we want to hug data and other times when we want to break up with it. Finding the insights you need to construct solid buyer personas can seem overwhelming, but here are some places to focus your data hunt. In Google Analytics, look at the usual, like search terms, behavior patterns, and top-performing content. How someone finds your website, explores, and interacts are all behavioral clues that reveal your buyer persona’s driving force. 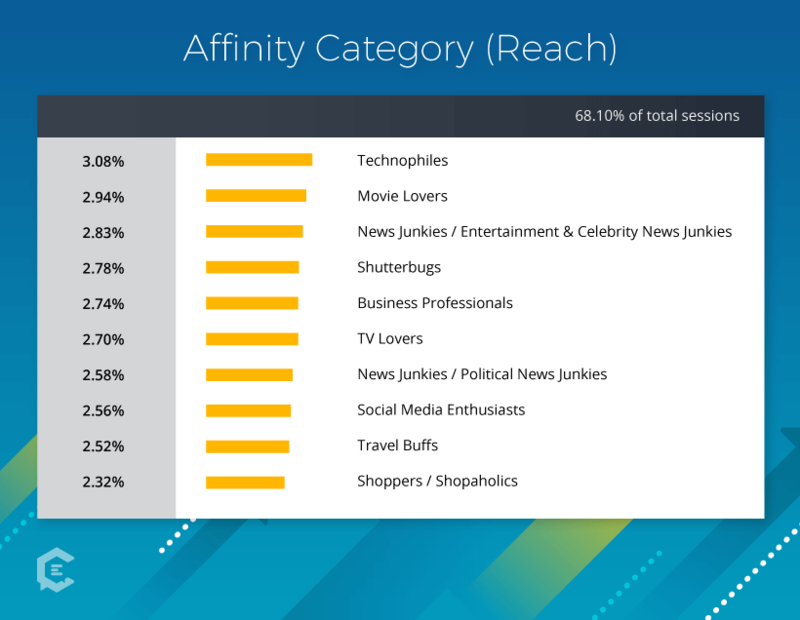 Also dig around the Audience category for Interests, Geo, Technology, and Demographics, like age and gender. Social media analytics have a wealth of data you can tap into as well. You have more data than ever before in your marketing automation solution… Take advantage. Segmented lists in your marketing automation system are often persona-based. Campaign performance analytics is a fantastic place to explore how prospects are interacting with different types of content. Lead-scoring behaviors will also offer valuable insights. Dive into your CRM, where you have plenty of buyer persona fields to work with, like: title, industry, etc. (Here are the steps to set up persona fields in Salesforce.) Understanding these basic informational details of your client database is critical in defining your buyer personas and your messaging. A blog post for a CMO will be strikingly different from a resource for a marketing manager. Put your ear to the ground on Twitter, Facebook, Instagram, and LinkedIn. Search client and prospect accounts to take the pulse on your ideal buyer. Use hashtags and social listening solutions to monitor conversations relevant to problems your product or service will solve. Quora and Reddit are also great places to snoop around. Go straight to the source. Conduct both internal and external surveys to discover insights from clients you already work with and prospects you have yet to reach. You really want this data, so keep surveys concise and resist the urge to ask all the things you’re dying to know. Focus on the top three goals and top three challenges. Also, include a question that is relevant to your product or service to grab more intel about how you can help that client or prospect succeed. Lastly, go ahead and confirm their title in the survey as this is always a matter of debate amongst internal teams. Titles vary wildly, so just ask the survey responder to provide that data point. Simple is always better. Easier said than done, since buyer personas are people (aka complex creatures). There is no cookie-cutter way to build buyer persona profiles. A lot will depend on the complexity of the product or service that you offer. Break it down to information that will help your organization understand that person’s hopes and fears — so you know how to provide value through the content you create for each buyer persona. A marketing agency has multiple services and they work with clients that span roles and organizations in a variety of industries. It makes sense for an agency to need quite a bit of diversity in their buyer personas — say, versus a SaaS company that is a human resources management platform. Buyer personas must be easy to grasp. Stick to no more than 12-15 pieces of information for each persona, with a mixture of basics and details. The magic number for buyer personas depends on the size and complexity of your organization. A good rule of thumb is to create somewhere between 3-5 buyer personas. Too many personas make messaging more complex than it needs to be. Too few personas make it difficult to hone your messaging strategy. If we look back at the marketing agency example, they might have one persona for each main service they offer. If they have five service buckets, they will have five personas. While a SaaS company with a niche market might only have three buyer personas that cover the spectrum. Because we’re talking about packaging up human personalities, you’ll want a distinct set of buyer personas. However, like the basic and detailed information you narrowed down, the number of buyer personas should be as simple as possible. Goals: Increase content production with the ever-growing client base. Challenges: Spending too much time vetting freelance writers. How we help: Connect Sandy with experienced, efficient writers through ClearVoice. 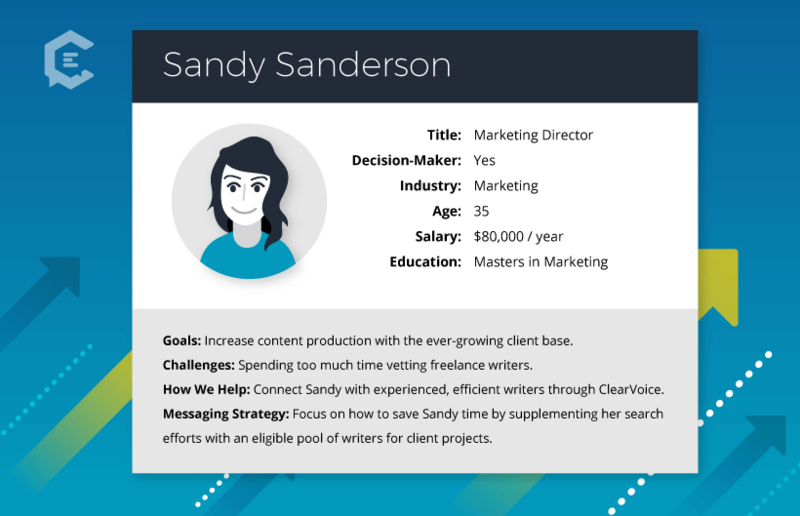 Messaging strategy: Focus on how to save Sandy time by supplementing her search efforts with an eligible pool of writers for client projects. Goals: Deliver qualified leads to sales to grow user base and achieve revenue goals. Challenges: Need to improve conversion rates on website with more relevant content. How we help: Connect John with tech-savvy tech writers through ClearVoice. Messaging strategy: Focus on how to increase engagement for John by providing subject matter experts to write B2B content. Creating buyer personas is never one-and-done. Just like with any of your marketing campaigns and brand information, remain agile. Nothing is ever one-and-done with buyer personas. Plan on revisiting your buyer personas once a year. If your organization is growing or evolving at a rapid pace, you will need to refresh personas more frequently. If you don’t spend enough time and energy during the research phase, you may discover your personas aren’t quite right. You can always tweak these buyer personas after the fact. Maybe your organization used to create targeted content for mid-level managers, but revenue wasn’t happening at the expected pace for growth. Then, you make the switch to go after decision-makers. That means back to the drawing board, with a whole new set of buyer personas and a revamped content strategy to engage them. A/B test email campaigns with various messaging in segmented lists. Come full circle to the data channels you used for the persona creation process. Refresh your personas annually, especially if there is a rebrand or strategy overhaul. About 77% of the most successful B2B content marketers use personas. Take the time to develop strong buyer personas, and don’t feel intimidated with this important exercise. Buyer personas are the foundation for your entire B2B content marketing strategy. Do it right.